It’s been a while and I’ve missed it terribly, so welcome back to Wallpaper Wednesday. Due to a rather busy blog and a rather jaded blogger, this regular feature took a little break over the last fortnight but I’ve found a fantastic paper for you to drool over this week. 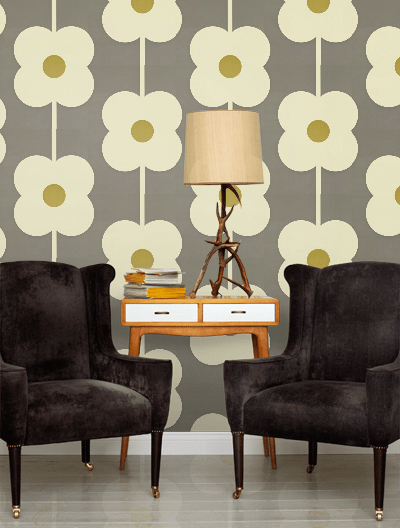 As you know I love dramatic, bold wallpapers that really make a statement and I think Orla Kiely’s Abacus Flower really does tick all of those boxes and then some. I’m not always a fan of Orla Kiely prints, but I’m loving the retro feel of this one, and if you’re a child of the ’70s like me, you may even remember your parents having something similar on their walls back then. I think you could even use this in a child’s room; it’s so fun and cool! As with all great collections these days, it comes in lots of different colourways, but I chose this lovely green and grey to showcase on the blog today. Giant Abacus Flower retails at £49 per roll at WallpaperDirect. Secondly, I’ve gone with a slightly more subtle wallpaper for the next piece from the collection. 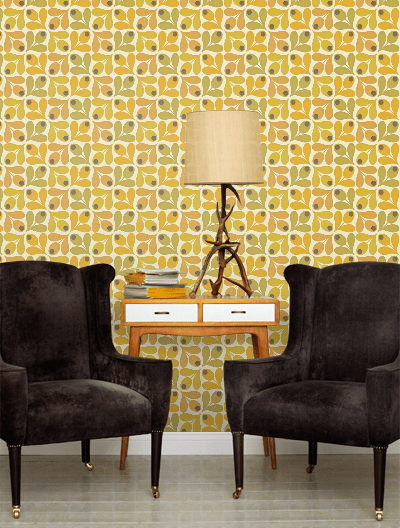 Acorn Spot features stylised acorn cups in a retro geometric look. 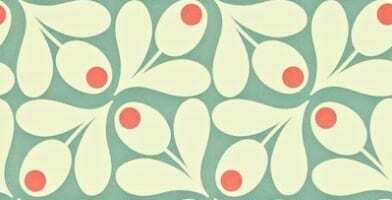 A smaller print in various colour combinations that demonstrate the ’70’s beautifully. This one is in teal with red spots. And I’m also loving it in orange, yellow and green, with grey spots. Again, Acorn Spots sells for £49 per roll at WallpaperDirect. What do you think of this retro selection? Could you see yourelf using any of these wallpapers? Love the first one, if I really had to choose one that what I’d go for. Love Orla’s designs. I actually really like the table and chairs too! I really like the first one, it would make a very striking feature wall. The first one, Giant Abacus Flowers is getting a lot of love on FB and Twitter too. I agree, it’s my favourite as well, would love to see this on one of my walls! That’s great, it wouldn’t do for us all to like the same thing. I just love the retro vibe of the patterns and colouring.